All Purpose Cleaner & Traffic Film Remover. R222 Total Auto Wash is a highly effective citrus based, biodegradable cleaner which does not rely on harsh chemicals for its cleaning power. 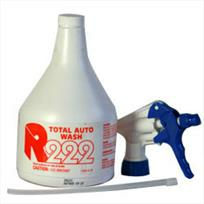 R222 Total Auto Wash is tough enough to use on rocker covers and engine bays, yet safe enough to use on chrome, rubber and even carpets & seats! As with most degreasers, Total Auto Wash should not be used on hot surfaces. NOTE: Spray head is NOT included but is available separately.